When they need CPR, you need ZOLL. Confidence that comes only from real CPR help. Step-by-step support for the entire Chain of Survival. 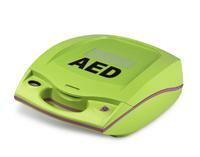 The ZOLL AED Plus gives even infrequent rescuers the confidence they need to help save lives. Simple audio prompts and pictures reinforce every step in the resuscitation process. On-Site Set up and In-Service - A local ZOLL representative will provide an in-service for you and your staff right in your office. Real CPR Help - Real-time feedback for rate and depth of chest compressions during CPR. The AED Plus is the only AED that sees what the rescuer is doing during CPR and provides audio and visual prompts for PUSH HARDER and GOOD COMPRESSIONS. 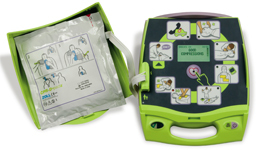 Lowest Cost of Ownership - Once installed, there is nothing to purchase or replace for the AED Plus for five years, as the consumer batteries and one-piece CPR-D-padz Electrode have a five-year shelf-life. As guidelines change or updates are available the AED Plus can be upgraded at the doctor's office with a simple download from a CD/internet through the IR port.